WASHINGTON — As thousands gather in the nation’s capital for the Congressional Black Caucus Foundations’ Annual Legislative Conference, leaders say the message and motto is simple: And Still I Rise. While political leaders, experts and a ‘who’s who’ in media, entertainment and politics come together to network (and party), it is also a time for serious conversations on issues affecting communities of color. On Wednesday, black women led the discussion on criminal justice, voting rights and job creation. At the highly anticipated Black Women’s Roundtable policy forum discussion, political leaders, activists, and experts discussed results from the Power of the Sister Vote Poll conducted by the roundtable and Essence Magazine. According to the poll, key issues among black women are affordable health care, criminal justice reform, jobs and public education. The survey also found that there is a growing belief that no political party represents black women. Black women’s support for the Democratic Party dropped 11 percent over the past year. This is an alarming decline activists said the Democratic National Committee should pay attention to. Black women gave President Trump, an ‘F’ approval rating, the survey said and found an increase in black women wanting to run for local office. Ashley Allison, senior adviser of the Leadership Conference on Civil and Human Rights and former deputy director of the Office of Public Engagement under the Obama administration said the results of the survey aren’t surprising. She also sees the fall in Democratic support as a positive sign of political independence among black women. “I don’t owe anything except myself, and that includes my vote. So if you want my vote you better earn it and you better talk about issues that are important to me,” Allison said. Black women were visible in other ways at the conference, held at the Washington Convention Center. 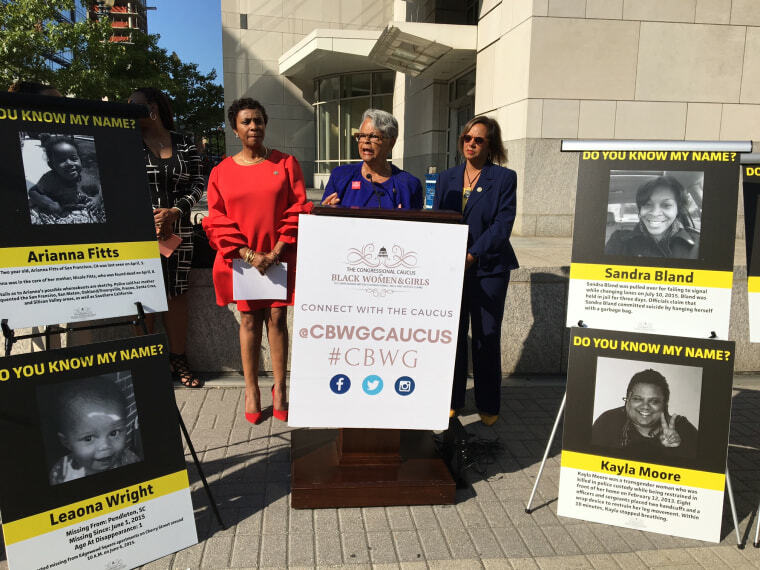 In order to bring attention to the number of black women and girls who are missing or have died in police custody, poster boards of some of them, including Sandra Bland, were placed around the arena as part of the “Do You Know My Name?” campaign, created by the Congressional Caucus on Black Women and Girls. 218,818 black people were reported missing in 2016, according to a report by the FBI National Crime Information Center. The Black and Missing Foundation reports that out of 647,435 people who were missing in 2016, 242,295 of them were people of color, Derrica Wilson, co-founder of the foundation, said. As robust conversations about criminal justice, voting rights and other issues continue over the five-day conference, Andra Gillespie, a political science professor at Emory University, says other issues such as hate crimes should be on the the table. Gillespie said the focus can’t be solely on navigating the Trump administration and one must engage all three branches of government. As a wave of white nationalism sweeps the country, companies such as Airbnb have taken measures to fight extremism by canceling accounts of suspected Nazis who were booking rooms in Charlottesville, Virginia for the white nationalist rally. As part of their push to be more diverse and inclusive, the company announced actor and activist Danny Glover as an adviser to engage communities of color. Airbnb director of national partnerships and Women’s March organizer Janaye Ingram said the company has been working on a strategy to keep racism and bias off the platform. “When you’re supporting Nazism or you’re part of the KKK that is antithetical to our community commitment and to our sense of universal belonging,” Ingram said.